A Cake Bakes in Brooklyn: What Would You Do? DH just returned from a week in the Pacific Northwest, where he enjoyed delicious cherry pie. So being that it's Father's Day (and he is such an extraordinary father), I thought I'd bake him one here in the Northeast. 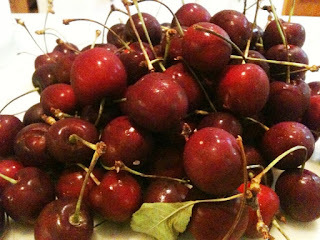 But, as I went through some recipes this morning, I realized that I bought the wrong kind of cherries. I didn't know that one was supposed to use sour (not sweet) cherries in pies. As many of my readers know, I often make mistakes *during* baking, and then meeting (or not) the challenge to correct them. This is a first, though, knowing in advance that something is wrong. I'm hoping an answer will emerge during yoga this morning: Just plunge ahead and bake a pie that may not be so good, or abandon the project entirely. the "wrong" thing could be more interesting or not... add lemon? Margaret: I decided the risk was too great (I thought that the texture, as well as the flavor might be off), so I went to the Sunday farmer's market and bought some sour cherries. Pie is in the oven now. A Tassie by Any Other Name is....an Ozone!